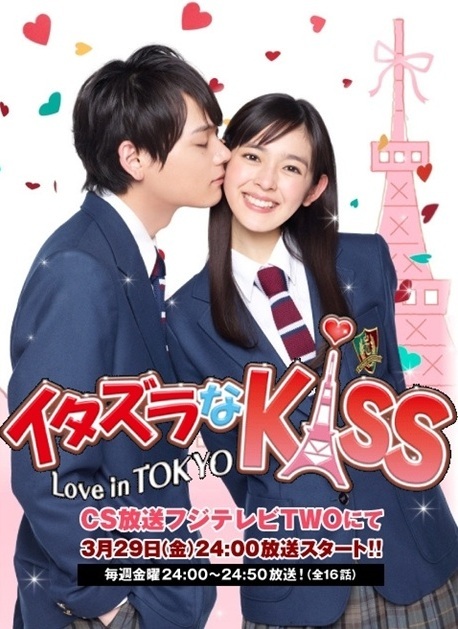 The more I watch of Itazura na Kiss the more I like this. I guess that's true of most dramas, but even I'm surprised at how much I enjoy my weekly doses of this show. As mentioned before, I was far from impressed by the first 5 episodes. It felt like a complete rehash of ISWAK, with an overacting heroine and an underacting hero. All of this is still true, but I've persisted through and am learning to enjoy it regardless. I think it's because we've finally hit the sweet spot of the story, which is the post-tennis competition phase. This has always been my favorite part of the drama/manga, because the romance feels more true and the characters have finally hit that cusp of maturity and self-discovery. It doesn't hurt we get everything from a stolen kiss to a Christmas party celebration and an overnight stay. Again, the boon of this version is the speed of the story. I was surprised to learn this is 16 episodes rather than the standard 11 dorama, but I'm definitely looking forward to the remaining ones. The 40-minute episode length keeps things from dragging and forces tighter story-telling. In an age of frustrating dramas and draggy plots, this one is so nice and breezy and is the main reason why I enjoy it. Once I got over Kotoko's exaggerated acting, I was able to sit back and just enjoy the angst-free, light-as-air story. Speaking of Kotoko, I think the actress has toned down a bit, or maybe I've become accustomed to her. I actually like that she's managing to portray ditzy without being desperate/pathetic (ahem Ariel), and that even when she's admitting her one-sided love she sounds self-aware and confident in it. Even Jung So Min was frustratingly obtuse and mopey at times. I'm also liking Naoki more and more. But seriously, he really didn't have to try very hard, as the character is pretty much born with my love. The actors together are admittedly very compatible, and HOMG that stolen kiss scene was good. I still think the ISWAK one beats it out (mainly because it felt more natural and was so beautifully scored), but this is a close second. Kin and her two friends are the only ones that annoy me. The latter two have probably the most useless and shrill scenes of any drama I've watched lately. Kin is ok, but he's been on the boring lecturer side of things lately. Less of them and more of my main pair please. I find I'm going to seriously miss the 1 week a week, 40 min long episode x16. It's somehow absolutely perfect for pacing such a story as this. Most Kdramas are too long (in minutes And overall duration), and Jdramas seem to end too quickly or not give me enough time to warm up to characters. I agree, whoever decided the format for this show was spot-on. As for ISWAK, I'm debated on whether to recommend it or not. I will say that it has some pretty swoon-worthy moments thanks to Joe, especially in the latter half. The entire high school sequence was slow and annoying, so I'd fast forward through that and start watching at the first kiss. Unfortunately there's not much you can do about Ariel's scenes except to sit and grimace through them. However, the gorgeous OST and solid acting from the whole cast make this a worthwhile watch, so if you have the time I think it's worth exploring.